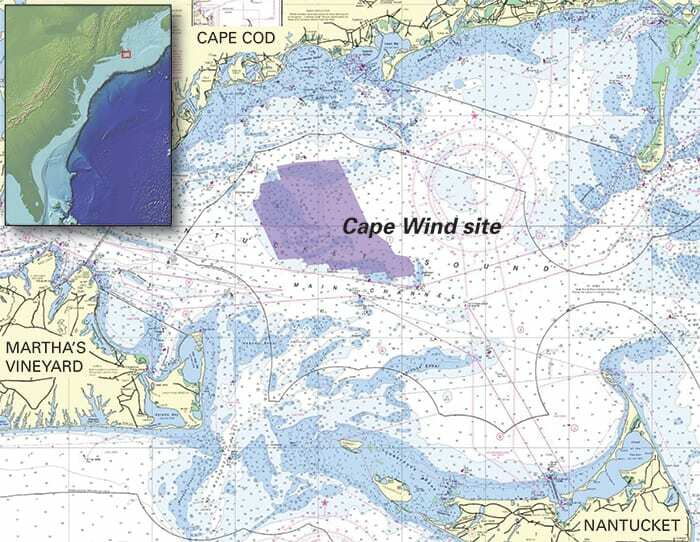 Federal officials examined a long list of potential impacts from the nation’s first offshore wind farm, slated to begin construction in Nantucket Sound in 2013: effects on ocean vistas, airplane and boat navigation, water and air quality, fish stocks, migrating birds and whales, even electric and magnetic fields. Still, two scientists at Woods Hole Oceanographic Institution (WHOI) say another factor needs to be looked at, or rather listened to, more closely: sound. In March 2012, Mooney and WHOI biologist Laela Sayigh began recording the underwater “soundscape” in the 25-square-mile area between Nantucket and Cape Cod where a company called Cape Wind plans to put 130 440-foot-high turbines. Using digital acoustic monitoring instruments anchored to the ocean bottom, they plan to measure and identify all underwater sound at the site—before, during, and after construction. The first-of-its-kind experiment in the United States, they believe, could serve as a template for assessing possible impacts, good and bad, of future offshore wind turbine projects. How noisy now, how noisy later? 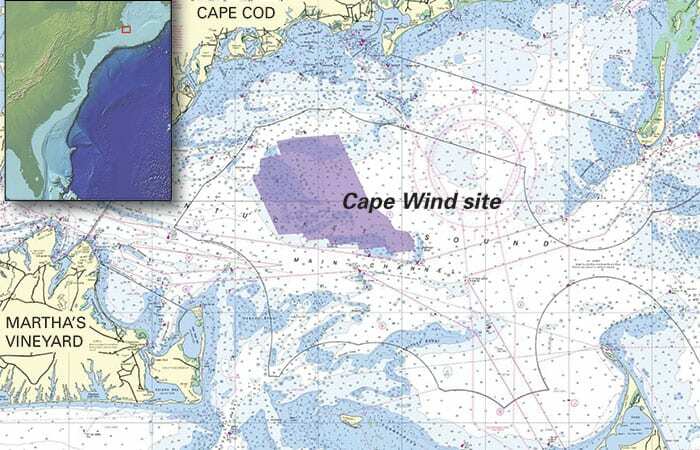 “When Aran suggested monitoring the Cape Wind site, I thought, ‘That seems pretty basic—it’s right in our back yard, and it’s such an obvious way to get a sense of what’s out there.’ We are looking not just at marine mammal sounds, but also fish sounds, boat noise, and more,” said Sayigh. According to the U.S. Department of Interior report approving the wind farm, “Noise impacts are expected to range from negligible to minor for onshore and offshore receivers” during the construction phase. (Note that there is no mention of “underwater” receivers.) “Operational noise impacts are expected to be negligible” for onshore, offshore and underwater locations, the report said. But Mooney said that construction of wind turbines, requiring seabed excavation and supports, could introduce significant amounts of loud noise into the underwater environment. Once built, he said, the steady operation of metal turbines will generate continuous noise, perhaps at the frequencies used by marine mammals or fish. Marine animals and boats make sounds in a wide range of frequencies that the recording instruments will capture, and analysis of the data will tell researchers whether dolphins, seals, boats, or fish are nearby. Mooney studies how marine animals use sound (he was one of the first to show how squids can hear). Sayigh studies how marine mammals behave, vocalize, and communicate, focusing on sounds made by dolphins in social groups. “Calls from gray and harbor seals are generally below 5 kiloherz or so,” Mooney said. “Dolphins’ sounds could be much higher, with calls ranging from 5 to 30 kHz, and echolocation in the ultrasonic range with frequencies as high as 150,000 hertz, or 150 kilohertz. Sounds of fish, and the sounds we humans produce from boats and construction, are lower frequency, essentially one kilohertz or below. 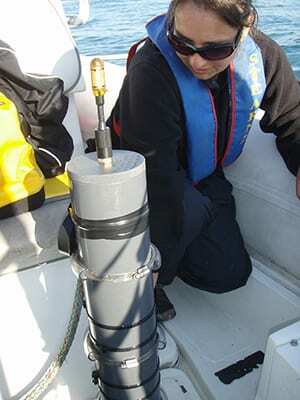 Mooney and Sayigh use two types of acoustic recorders—a commercially available one and another called the “DMON” (digital acoustic monitor) made at WHOI by engineer Tom Hurst and colleagues. 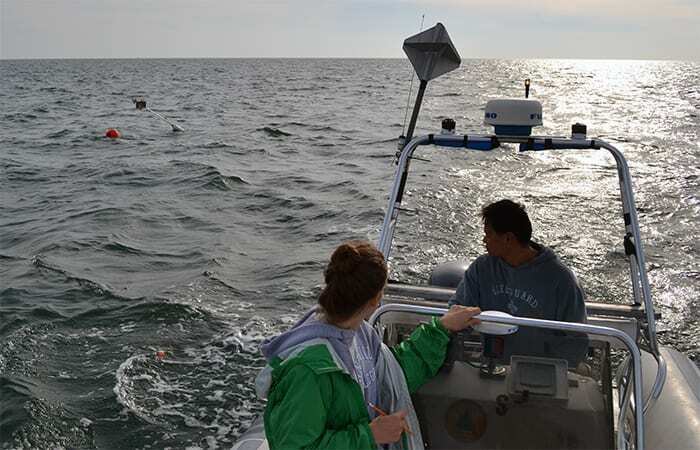 The researchers travel by boat five miles out of Woods Hole and place the sound recorders on small moorings anchored at about 40 feet deep on Horseshoe Shoals, a shallow section of seafloor between Nantucket Island and Cape Cod. Each type of recorder has advantages and disadvantages. The DMON, about 18 inches long and 4 inches across, continuously records all the frequencies Sayigh and Mooney want to capture, but only for a week at a time. The commercial version is large, about a yard long, heavier, and bulkier, and only records frequencies up to 40 khz. But its advantage is that it can be set to record for one minute every ten minutes, thus spreading out the battery power and hard-drive space and recording for two to three months without needing to be replaced. “So we’re making the best of both worlds, putting one device out to get a really in-depth look for one week, and then we continue with the other device to get a sampling period of several months, then we replace both,” Mooney said. The early results reveal both familiar and unidentified sounds. “We definitely have fish called cusk eels, whose sounds are really abundant, but we’re getting a lot of fish sounds that we just haven’t figured out yet,” Mooney said. Even invertebrates make sounds: Crustaceans called snapping shrimp, for instance, make both very loud snapping sounds and low rumbles. The researchers anticipate learning more about what animals inhabit the turbine area, how abundant they are, and even what they are doing, by listening in. “Animals make sounds when they attract mates or reproduce, and you can track those activities just by listening,” Mooney said. “What I’d love to do with this project is to look at biological diversity. In a nice healthy habitat, you have a spectrum of sounds: low-frequency sounds of fish, then invertebrates a little bit higher, and then the seals and the dolphins.” The soundscape of an undersea area under an environmental stress would sound different; the impacts could be assessed by listening to what’s missing, for example. 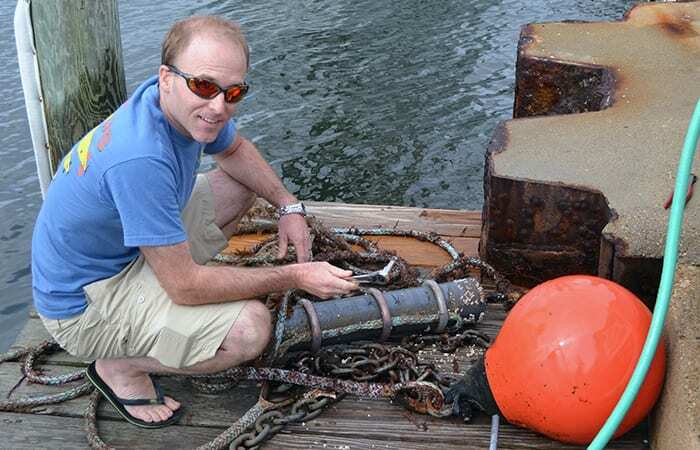 Mooney and Sayigh’s study, funded by Woods Hole Sea Grant with a contribution from the WHOI Coastal Ocean Institute, will continue for at least two years. The researchers hope to keep monitoring a year longer, to include pre-construction, construction, and operational phases of the wind turbines. Such underwater sound monitoring has not been done at offshore wind farms elsewhere, Mooney and Sayigh said. An article on Aran Mooney research in Oceanus.